In the previous post, Network Monitor Reloaded, we walked through the reasoning for refactoring the Network Monitor tool. 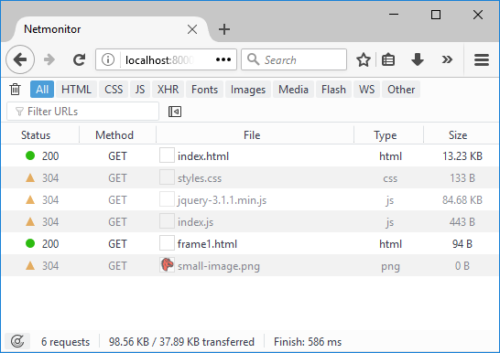 We also learned that using web standards for building Dev Tools enables us to running them in different environments – loaded either within the Firefox Developer Toolbox or within a browser tab as a standard web application. In this companion article, we’ll show you how to try these things and see the Network Monitor in action. The Firefox Developer Tools code base is currently part of the Firefox source repository, and so, downloading it requires downloading the entire repo. There are several ways how to get the source code and work on the code. You might want to start with our Github docs for detailed instructions. One option is to use Mercurial and clone the mozilla-central repository to get a local copy. Part of our strategy to use web standards to build tools for the web also involves moving our code base from Mercurial to Git (on github.com). So, ultimately, the way to get the source code will change permanently, and it will be easier and faster to clone and work with. 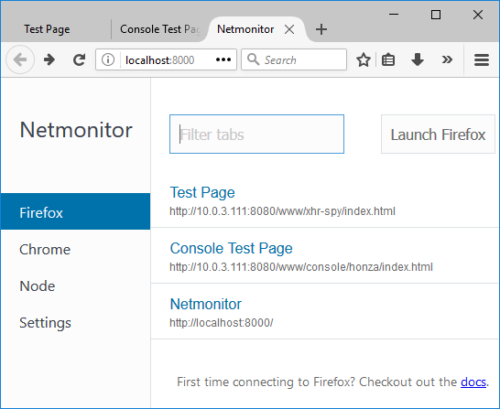 For now, if you want to build the Network Monitor and run it inside the Firefox Developer Toolbox, follow these detailed instructions. Essentially, all you need to do is use the mach command. After the build is complete, start the compiled binary and open the Developer Toolbox (Tools -> Web Developer -> Toggle Tools). We’ve developed a simple container that allows running Firefox Dev Tools (not only the Network Monitor) inside a web page. This is called Launchpad. 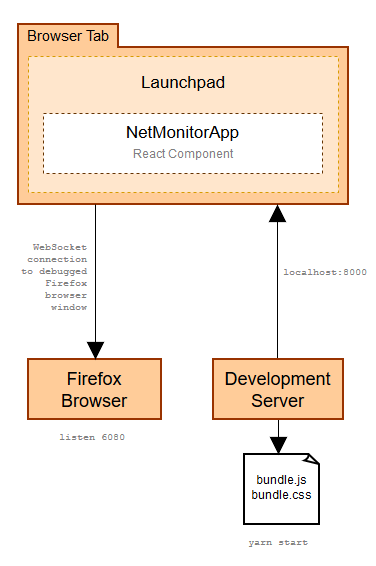 The Launchpad is responsible for making a connection to the instance of Firefox being debugged and loading our Network Monitor tool. The Net Monitor tool (client) is running inside a Browser tab just like any other standard web application. The Net Monitor tool (client) is connecting to the target (debugged) Firefox instance through a WebSocket. The target Firefox instance needs to listen on port 6080 to allow the WebSocket connection to be created. Let’s take a closer look at how to set up the development environment. Next, we need to listen for incoming connection in the target Firefox browser we want to debug. Open Developer Toolbar (Tools -> Web Developer -> Developer Toolbar) and type the following command into it. This will start listening so tools can connect to this browser. The Developer Toolbar UI should be opened at the bottom of the browser window. You should see the Launchpad user interface now. It lists the opened browser tabs in the target Firefox browser. You should also see that one of these tabs is the Launchpad itself (the last net monitor tab running from localhost:8000). All you need to do is to click one of the tabs you want to debug. As soon as the Launchpad and Network monitor tools connect to the selected browser tab, you can reload the connected tab and see a list of HTTP requests. If you change the underlying source code and refresh the page you’ll see your changes immediately. Check out the following screencast for a detailed walk-through of running the Network monitor tool on top of the Launchpad and utilizing the hot-reload feature to see code changes instantly. You might also want to read mozilla-central/devtools/client/netmonitor/README.md for more detailed info about how to build and run the Network Monitor tool. We believe that building tools for the web using standard web technologies is the right way to go! Our tools are for web developers. We’d like you to be able to work with our tools using the same skills and knowledge that you already apply when developing web apps and services. We are planning many more powerful features for Firefox Dev Tools, and we believe that the future holds a lot of exciting things. Here’s a teaser for what’s ahead on the roadmap. Great news, thanks for the articles! Seems like it should be “https://hg.mozilla.org/mozilla-central”? Great article, read both parts. Thanks to Honza for all the detailed explanations. This would help a lot to unlock the puzzle lying underneath [for beginners]. Sorry for the delayed response. Busy days here in Mozilla-land!